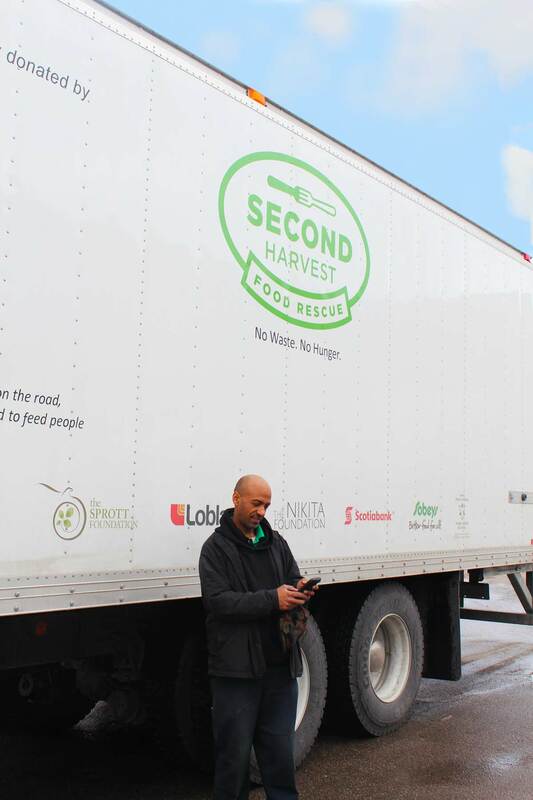 Second Harvest, Canada's largest food rescue program, picks up donated food that would otherwise have gone to waste, and delivers it to community agencies to feed those in need. In the last 12 months, Second Harvest has rescued over eight million pounds of food from grocery stores and other partners. "Our main goal is to provide food to as many people experiencing hunger as possible," said Lori Nikkel, Director of Programs and Partnerships at Second Harvest. "Flowfinity enables us to track pickup and delivery information digitally using mobile forms, and send the information back to the office in real-time for reporting and integration. This provides us with better visibility into how the food is donated and delivered, so that we can optimize our services and ultimately help more people." "Flowfinity enables us to track pickup and delivery information digitally using mobile forms, and send the information back to the office in real-time for reporting and integration." Second Harvest has a team of drivers that pick up food donations and deliver them to about 220 different agencies, 7 days a week. At every stop, drivers record information about what was picked up or delivered. This was previously written down on paper forms and submitted back to the office for data entry and processing. The handwritten paper forms were time consuming to process, particularly because most of the data entry was handled by different volunteers. If a form was illegible or some information was missing, it would be set aside for regular office staff to review before it could be entered. This led to a stack of outstanding paper forms each week that took regular staff about half a day to process. It was also difficult to look up past information, which was all on paper and filed away. "We run eight routes a day, seven days a week, which is a lot of paper," said Nikkel. "For example if we required information regarding a specific driver pick-up or drop off it was extremely time consuming to find out. You can't filter information on paper. We're also not using the information as much as we could, because it's in files and boxes." Second Harvest was looking for a mobile solution that would increase productivity and enable better use of the data gathered in the field. "Our main goal was to move to a smartphone versus a paper system, and have the new system integrate easily with our database back at the office," said Nikkel. "We wanted to alleviate some stress on the drivers, by giving them the ability to track all of their daily activities and be able to look up data away from the office." It was important for the solution to be highly configurable, so that it could adapt to Second Harvest's business processes, terminology and forms. This would allow them to implement solutions that were more familiar to their staff and volunteers, requiring less training time to learn the new system. It was also critical for the solution to allow mobile apps in the field to be integrated with existing back-end systems in the office, for efficiency and reporting. "We wanted to have our driver information and recipient agency information easily importable and exportable into our new database, and accessible on mobile devices," said Nikkel. The team evaluated a number of different solutions, including more basic mobile forms solutions, custom built apps, spreadsheets on smartphones, and enterprise app platforms that require some coding. They selected Flowfinity because it was the most user-friendly and powerful solution that enabled them to build and modify custom apps and forms without programming. "I think Flowfinity is a fantastic product, very simple to understand, and user friendly. There is a lot of power behind it that's masked by how easy it is for the user," said Nikkel. "Because Flowfinity was so effortless for our staff, we were able to build a fully functional app during the product trial and evaluation phase. Instead of looking at a demo of the product, we could evaluate something that was already fully tailored for our use." Using Flowfinity software, Second Harvest customized a mobile solution that enables its drivers to enter required data during their routes, and look up information that they need throughout the day on mobile devices. At the office, staff can access Flowfinity data via web browser for reporting and analysis. Drivers use Flowfinity apps to keep track of donors, recipients, the weight of food picked up and dropped off by category such as meat or produce, how much food is actually used, times in and out, delivery truck maintenance and inspection information, fuel consumption, and more. "The information that drivers collect is extremely valuable," said Nikkel. "The most important question we want to answer is what do our agencies need, and what are they actually taking. For example, we see through our route review reports if an agency needs more food, so we can ensure that are trucks are loaded appropriately and help more people experiencing hunger." Keeping track of donations is also important, so that Second Harvest staff can send reports to donors on what was collected. This helps donors report on their Corporate Social Responsibility, and helps Second Harvest ensure they are receiving the right recognition. Each morning, drivers perform inspections on their vehicles and check in for their shift. Previously, the drivers' time in was recorded after they had performed their inspection and signed in to the computer system. Now, they can record an accurate start time using timesheets built in Flowfinity, and complete inspection reports on their smartphones. "With Flowfinity, we can streamline different business processes like having drivers check in upon arrival instead of after their vehicle inspection, which gives us a more accurate time in now for payroll purposes," said Nikkel. Keeping track of vehicle inspection information allows Second Harvest to optimize the performance of each truck, carry out preventative maintenance, monitor fuel efficiency, and more. If there is any damage made to a delivery truck during the day, now it can be entered in Flowfinity with a photo embedded directly in the form. "Previously if a driver found some damage to a vehicle, we didn't have an accurate way to track it. Sometimes they would take a photo and scribble on it if there was a dent, but not always. Now, we can take pictures of any vehicle damage directly in the Flowfinity app, sketch over them and submit them from a mobile incident report form," said Nikkel. The office gives drivers special instructions for each route - for example if an agency doesn't accept meat, or how many trays to pick up from a particular donor. This information was previously managed in spreadsheets and printed out for the drivers. Now all of this information can be entered into notes for each donor or agency, and copied automatically into a dispatched form. "Before, all of our instructions for drivers were just printed in the route sheet," said Nikkel. "We had spreadsheet columns for everything, which was a lot to manage. Now any notes will be inside of the drivers' Flowfinity apps, so they can easily view them." Flowfinity is a programming-free platform, which allows Second Harvest to easily add more features and forms when needed. Any app updates are instantly published to all users. The team found that once the initial solution was rolled out, they were able to identify even more ways to improve efficiency, and make the changes themselves. "Our team member who's managing and updating our apps is loving the power and simplicity of the tool." "We're very excited about Flowfinity. Our team member who's managing and updating our apps is loving the power and simplicity of the tool," said Nikkel. Second Harvest sees the potential to expand the use of Flowfinity to other staff and volunteers in the field, such as Hunger Squads who work to rescue food from smaller businesses such as restaurants. We chose Flowfinity because the software could do everything we wanted. It's a simple yet powerful enterprise mobile app solution, and it's easy to use and maintain.